It was windy, rainy and cold. So three of us “softball wives” dashed to the mall and of course to our favorite store, Pottery Barn. They see Merry and I come through the door and just smile and make sure one of the registers is ready for merchandise! 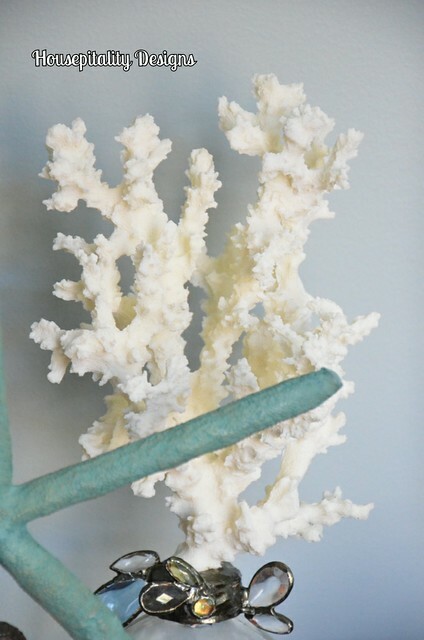 I purchased those great new coral and sea inspired items from their new collection. This is the before…I wanted to give the table a lighter feel. I am working on this bathroom…giving it a bit of a mini facelift..
…..still have a few more things to do. 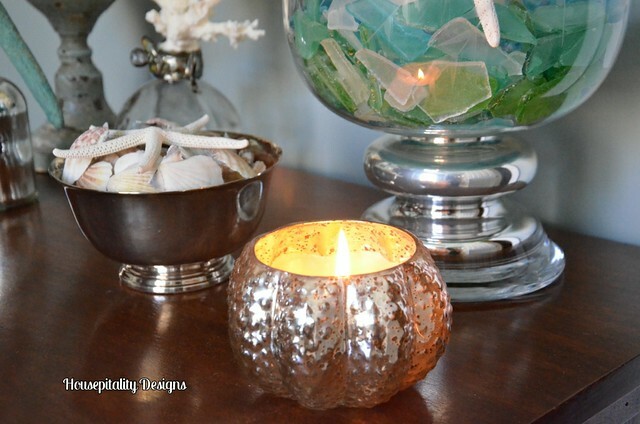 …..and the mercury glass “urchin like” candle are Pottery Barn. 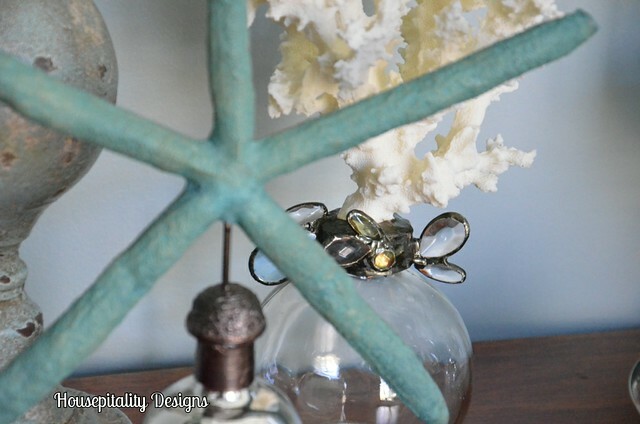 The blue finial was a Hobby Lobby purchase a couple of years ago. 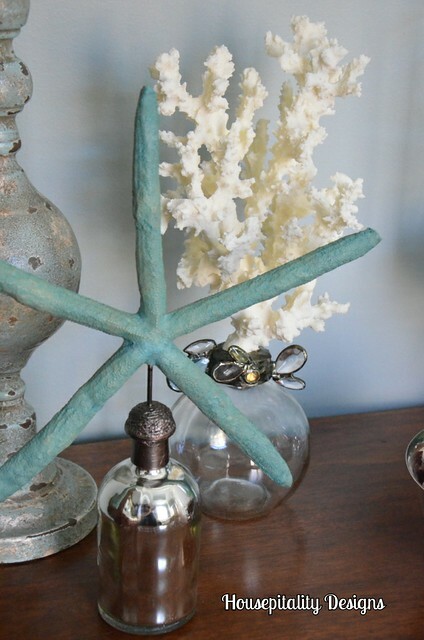 I love the “jewels” on the bottle of the coral. 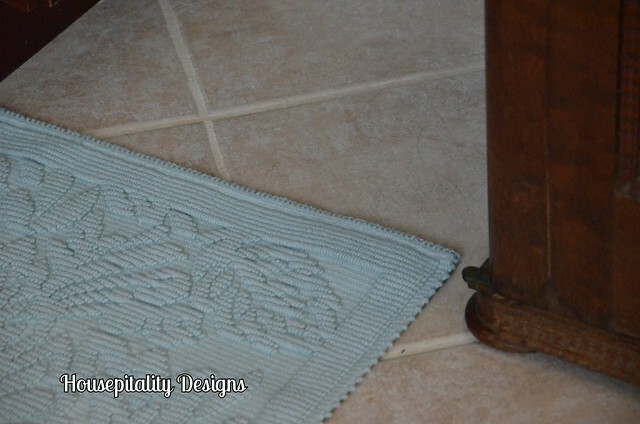 The silver bowl of shells and the hurricane were elsewhere in the house…and they moved here..
New rugs in front of the vanity…also from Pottery Barn. I also found this beauty and it found it’s way to the register. So we are finally home after being gone for 6 days and trying to catch up…. …..while enjoying the company of my granddaughter as she is on Spring Break. So many pretty things. I love their new items. 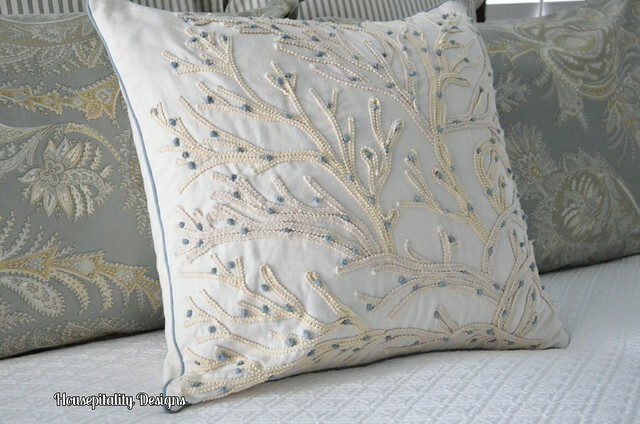 The rug is such a pretty color and the pillow looks great with your bedding. As usual, you have achieved beauty with your purchases! Wish I had 1/10 of your ideas for decorating my poor house! year! Seriously, whatever you use turns out gorgeous! 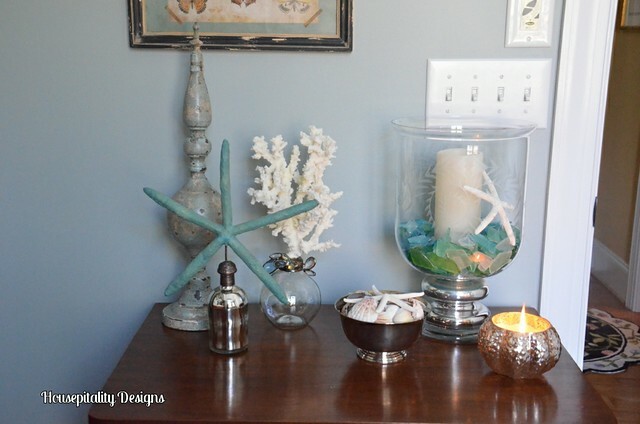 Love this vignette anyou finds as PB, I love that store. They always have something or somethings I want….. How did the hubby do in the tournament? ?…Have a gret Easter!! I love your new pieces Shirley!! Now I think I’ll be making a trip to PB!! Very nice! I like the new additions! I like how the blue HL finial worked in with it! We’re headed down to see my mom and they have a PB store there. I hope I get a chance to go in and see what I can’t live without! It doesn’t take much to create a whole new look as you so well demonstrate again and again. Love your new pretties, Shirley! So funny that those folks know all of you. 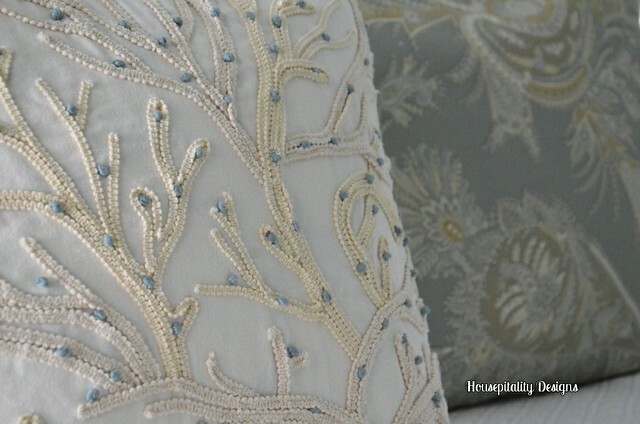 Love your new pieces and that pillow cover is gorgeous! 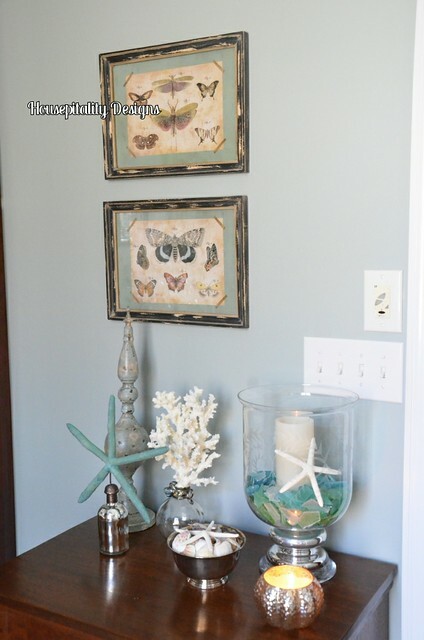 Perfect scores, Shirley … of course, they look gorgeous where you placed them! I’ve been meaning to sneak by PB … did you leave anything for the rest of us? LOL! I hope you all had fun this past weekend … small world, our neighbors’ dad (from NC) was playing in that same tournament, I believe. He said his team was “not” interested in playing at 10:00 Saturday night … wonder if he and your husband are on the same team?!?! In any event, I’m sorry I didn’t get to meet up with you! Becca’s recent post…It’s a Spring Thing (I Think)! I was just browsing the Pottery Barn catalog last night and noticing the new colorful coral. Everything you bought looks so fresh and perfect for the warmer months ahead. Enjoy this Spring Break with your granddaughter! How is the new store going for you and Amy? I’m so excited and proud of y’all! 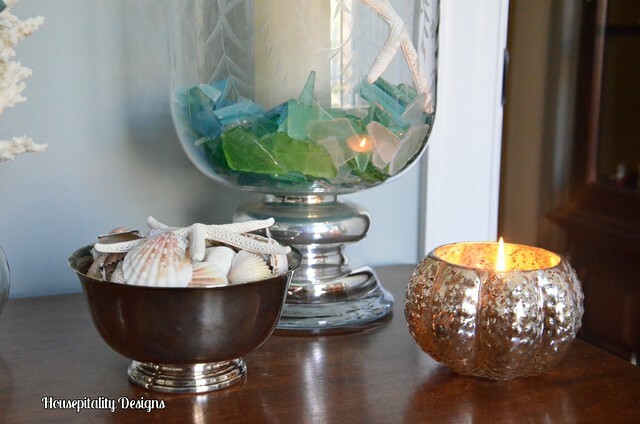 Hello, my name is Yvonne… and I am a Pottery Barn junkie!!!! I would fit right in with you girls. But I mostly shop PB outlet! I think their style is fresh and jun and goes with so much!!! LOVE all your summer touches. Beautiful Shirley! 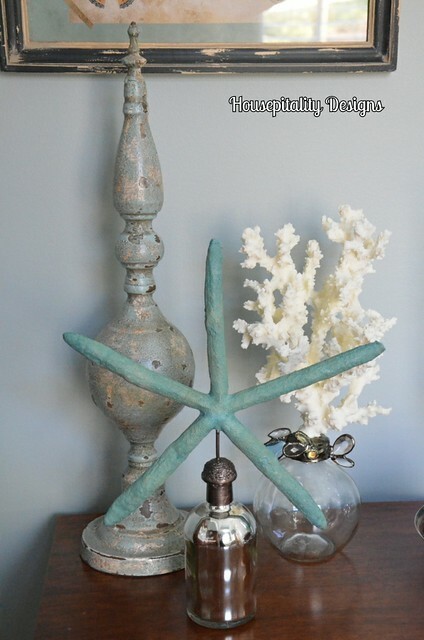 I was in PB earlier this week and thought to myself how fun to have a beach house to decorate with their coastal collection! Your pillow is perfection 🙂 Happy Easter! 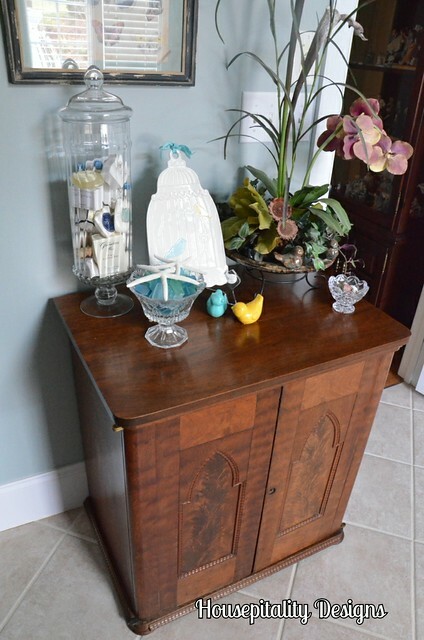 I love all of your new finds! They make me want to go to the beach now. Those are perfect for your bathroom. Our schools are on Spring break next week. So ready for some R & R! We’re not planning on doing anything in particular since we’re going to FL in July. I will work on my bedroom paint job next week though. Hope you have a wonderful Easter with your family! Beautiful PB finds, Shirley! Gabi wants to go to the new American Girl store over Spring break. Not too far from there…Pottery Barn. G’ma might have to stop by and have a look. Hi Shirley, I love the new vignette. Just right for warmer weather…right? It is going to get warmer, right? I really love the new look and I adore the chest. How is the shop coming? Have a Blessed Easter, He Is Risen! Savannah Granny’s recent post…STILL LOOKING FOR SPRING? Shirley, you found some great items! 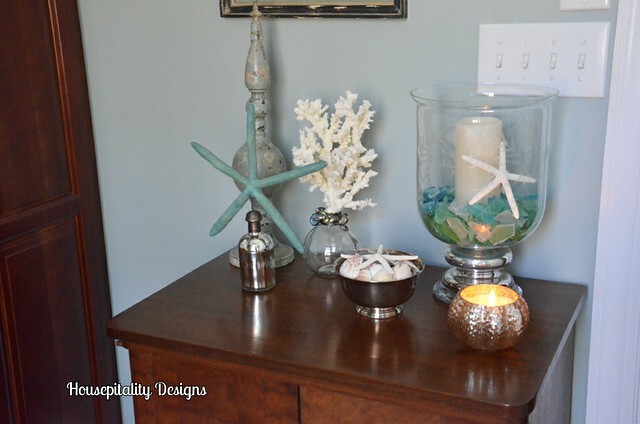 Love the sea glass in the candleholder, and the pillow is so pretty! So pretty! 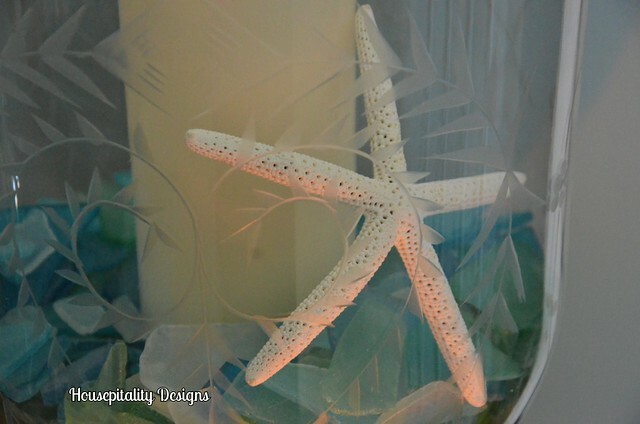 Light, beachy and your pillows are amazing! her effort for work or household work.